Learn about the top four exotic leathers for garments and why they are perfect garment-making materials. Alligator & Crocodile Skin: What is the Difference? Learn why crocodilian leathers are in such high demand and how to choose the best skin for your project. Avoid overpaying for alligator skins by ensuring you know exactly how they are measured and graded. Avoid overpaying for caiman skins by ensuring you know exactly how they are measured and graded. Become an expert on working with python skin by downloading our Guide to Buying Python Skin. 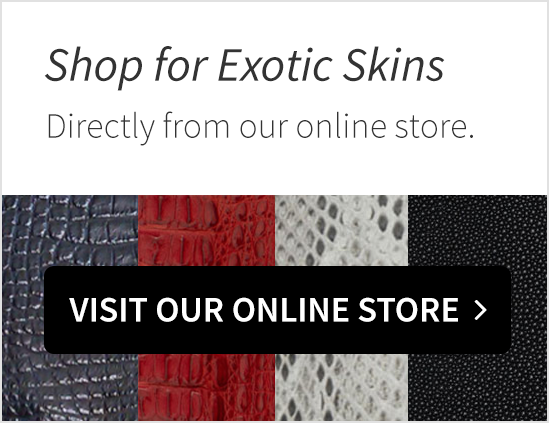 Curious about exotic leather products such as stingray skin? Become an expert by reading our guide. Compare Burmese, short-tailed, and diamond python skins to become an expert on what features to look for in chosing the right material. If you are planning an upcoming handbag design project, our free guide will teach you everything you need to know about selecting, sourcing, and working with different exotic leathers. Curious about exotic leather products such as Alligator, Python and Stingray skin and how much you will need for your project?